BMW, Audi and Mercedes rely on Edscha's components. MUNICH -- Insolvent German car parts supplier Edscha likely will be auctioned off to an investor. The company's insolvency administrator Joerg Nerlich sees a realistic chance of selling group. Nerlich said discussions to rescue the company are constructive despite the economic crisis and he sees a realistic chance that the company's plants and many jobs can be saved. He said the talks involved Edscha's customers, suppliers and banks. 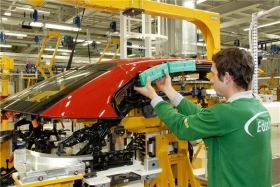 Edscha makes convertible roofs, hinge systems and driver controls for most major carmakers. BMW, Audi and Daimler's Mercedes-Benz and Smart are important customers. The supplier put its European operations into insolvency on Feb. 2 after a steep drop in revenues because of the economic downturn. It is still supplying its customers and its North American and Asian operations are not affected by the involvency. Edscha has sales of about 1 billion euros. It employs about 6,000 people at 29 factories worldwide. The company was bought by U.S. private equity company Carlyle Group at the end of 2002.